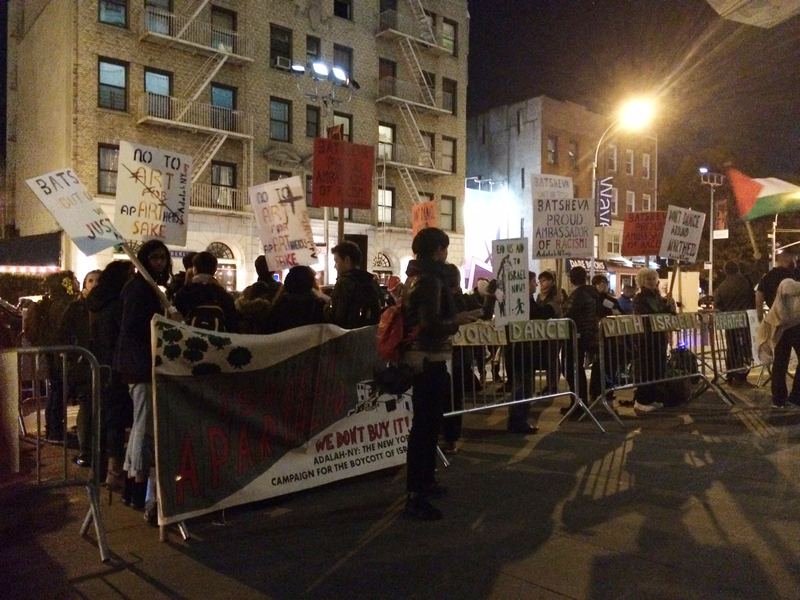 Organized by BDS advocacy group Adalah-NY, the protest area comprised a large barricaded pen in front of BAM’s Peter Jay Sharp Building at the corner of Lafayette Avenue and Ashland Place. 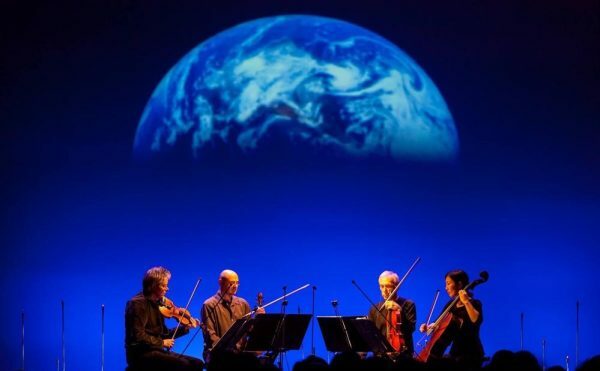 Musical accompaniment and performances were on hand from the Occupy Wall Street-affiliated 6 piece Rude Mechanicals band and two local dabke groups, among others. Passers-by accepted leaflets largely without incident, though at approximately 7pm a middle-aged caucasian male screamed unintelligibly from outside the barricade. 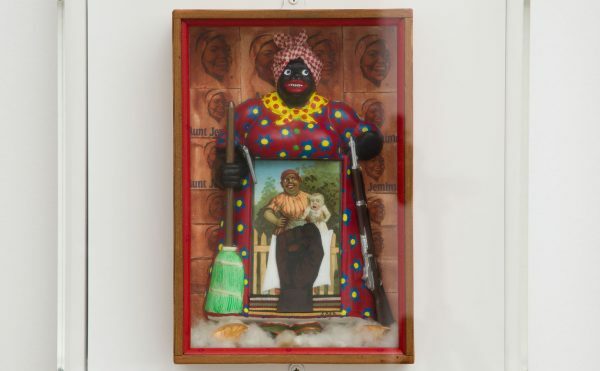 Asked about the apparent dearth of uniformed police officers present, an NYPD officer told Hyperallergic that an unspecified number of undercover agents were supplementing him and his colleague, both of whom were wearing blue Community Affairs jackets. Protesters in from of BAM on November 12, 2014. 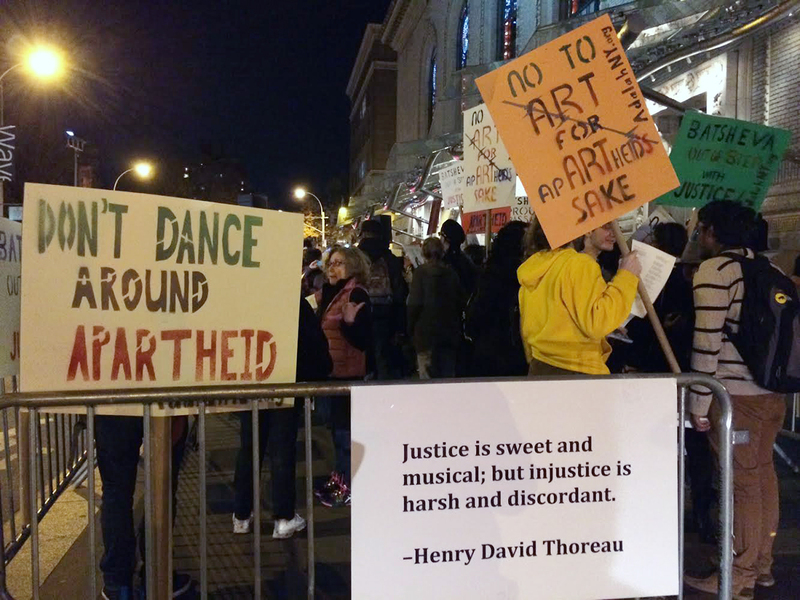 Near the end of the protest, which ran as permitted from 6:30 to 8pm, Rihan Barghouti of Adalah-NY informed attendees that another protest was planned for next Tuesday, November 18, against Idan Raichel at Symphony Space in Manhattan (Raichel reportedly receives Israeli government funding). 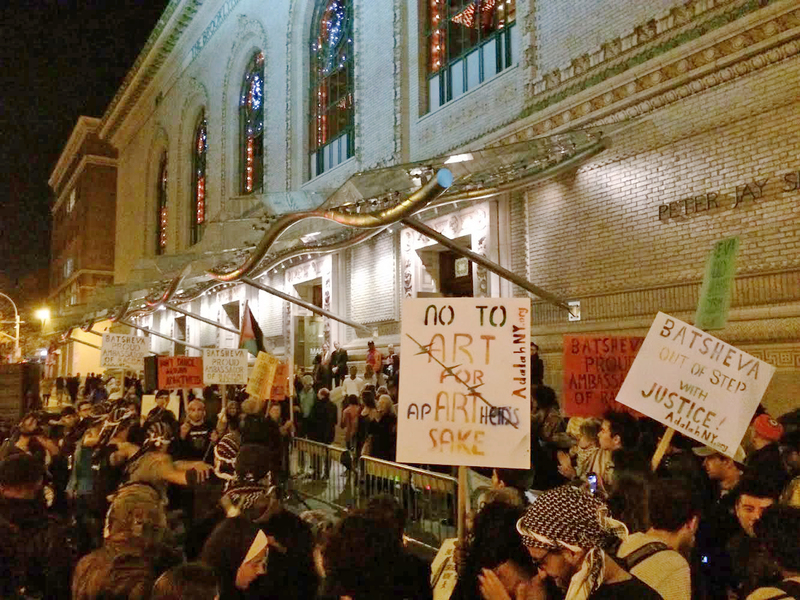 Adalah-NY previously protested Batsheva’s 2012 appearance at BAM; that same year a Batsheva performance in Edinburgh was disrupted by activists. BAM acknowledged but did not respond to a request for comment on the protest; email to a Batsheva representative went unreturned. Hannah Mermelstein of Adalah-NY told Hyperallergic that Batsheva artistic director Ohad Naharin has expressed some sympathies with protestors outside his performances in the past, though Batsheva did not respond to a query seeking to confirm this claim.